Car manufacturer Bugatti has built a one-off supercar from carbon fibre, which has already been sold to an anonymous enthusiast for a price of €11 million. 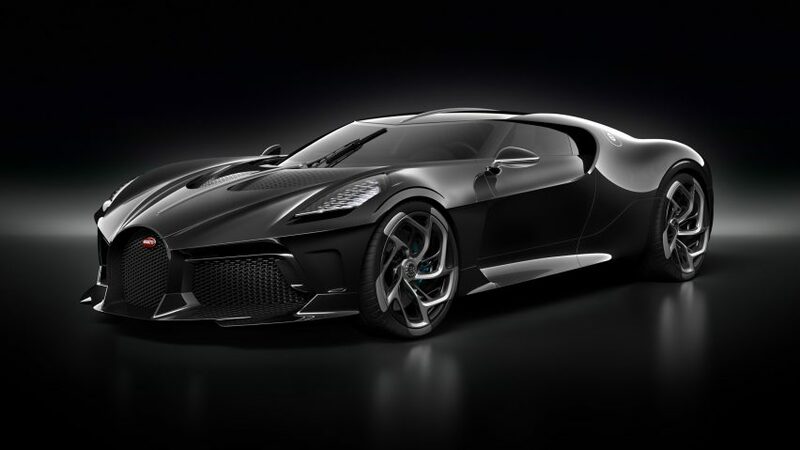 Unveiled at this year's Geneva Motor Show, La Voiture Noire – French for "the black car" – was sold to an unnamed Bugatti aficionado for an eight-figure sum. While the final price hasn't been confirmed, Bugatti disclosed that the car was bought for €11 million (£9.5 million) before tax – estimated at €16.7 million (£14.4 million) including tax – making it "the most expensive new car of all time". At this price, La Voiture Noire surpasses the Rolls-Royce Sweptail, which was sold to a private client in 2017 for approximately $12,800,000 (£9.8 million) including tax. The supercar boasts a 16-cylinder engine housed inside a sculptural body crafted from carbon fibre, with an extended front and the signature Bugatti C-line that separates the driver and passenger seats. The bumpers are smoothly integrated into the body and the windscreen seems to flow seamlessly into the windows at the sides in the manner of a visor on a helmet. "Every single component has been handcrafted and the carbon fibre body has a deep black gloss only interrupted by the ultra-fine fibre structure. This is a material that has been handled perfectly," said designer Etienne Salomé. The car is a modern interpretation of the classic Bugatti Type 57, designed by founder Ettore Bugatti's son, Jean, in the 1930s and 40s. Visually, however, it bears a closer resemblance to the Bugatti Chiron hypercar. "La Voiture Noire is a far more than a modern interpretation of Jean Bugatti's Type 57 SC Atlantic," said Bugatti president Stephan Winkelmann. "It is a feast of aesthetics." Winkelmann describes the supercar as a "coupé with the comfort of a luxury limousine and the power of a hyper sports car", and compares it to "the haute couture of exclusive Paris fashion designers." "Without any irritating lines, the surface is 'all of a piece' and there is nothing to disturb the optical flow," the company added. "This means that the hyper sports car has changed its attitude and become a grand tourisme – ideal for comfortable travel on long trips." Bugatti's La Voiture Noire was unveiled at this year's Geneva Motor Show, which is taking place at the Palexpo exhibition and trade centre in Le Grand-Saconnex until 17 March. Despite Bugatti incorporating a 16-cylinder, eight-litre engine into its latest model, most car brands at the motor show focused on electrifying their vehicles as a response to impending EU emission laws. From Polestar 2 to Seat's cross between a motorcycle and a car, we picked out 10 of the best electric cars from the event that could easily be seen on the roads in the near future.